Summer Books Week: Celebrating a Slatebreaking Year! And Brianna just moved to Wisconsin, where it’s actually beautiful and people like to be outside in the summer (I am still here in Phoenix where it’s 110 and summer means that we hide out inside in the air conditioning all the time). But one thing that summer has always meant for us is summer reading. Even though we’re not in school anymore, it just feels like this is the time for checking out huge stacks of books from the library and reading them on the beach. And you guys, there are so many good summer books. Most of Sarah Dessen’s books, for one thing. The Penderwicks. The Sisterhood of the Traveling Pants series, which (despite my first review for this blog), I hold a special place in my heart for. Summer of Fear. A Ring of Endless Light and The Moon by Night. That Baby-sitters club book where they all go to Sea City. SUMMER SISTERS, for crying out loud, which, now that I have thought of it, I want to just go to the library and get my hands on a copy. Seriously. Right now. And also, regardless of where we are, and what we’re reading, we feel like celebrating. Because today, June 18, 2012, is the 1st Anniversary of Slatebreakers! Seriously, we cannot believe we’ve been blogging for a whole year now. It has flown by, and its been so much fun. We’ve read some incredible books. Through twitter we’ve “met” some incredible authors and fellow bloggers. Megan McCafferty did an interview on our site. We met A.S. King and John Green and Stephanie Perkins and a whole bunch of other authors in person thanks to our amazing local indie, Changing Hands. We’ve become better writers and more thoughtful readers. We’ve connected with tons of other readers, who have gotten us so excited about being part of this online community. 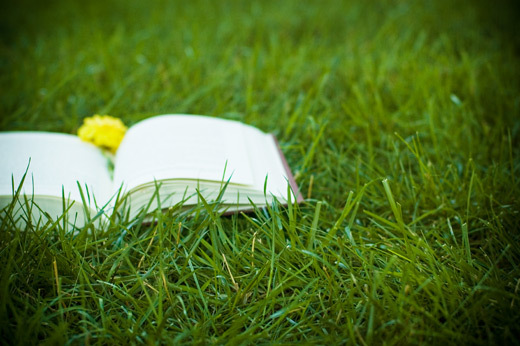 So in celebration of summer, in celebration of a year of reading, blogging, and breaking slates, we’re having a week of summer books on the site. AND, just to continue the celebration, we’re having our very first giveaway. Post your favorite Slatebreaking summer book in the comments. 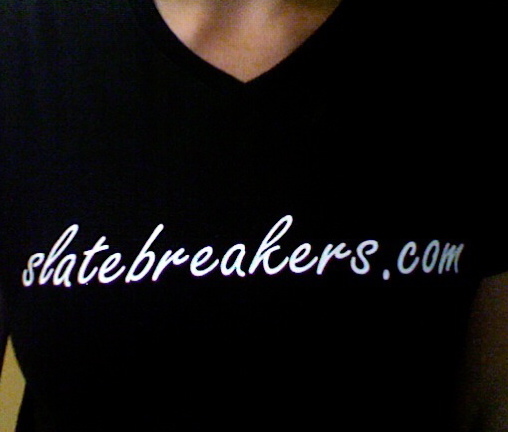 We’ll choose one at random and send you a Slatebreakers.com t-shirt! Thanks so much, to all of you, who have been part of our fabulous first year. We can’t wait for another one! This entry was posted in Theme Week and tagged Giveaway, Summer, Summer Reading. Bookmark the permalink. 5 Responses to Summer Books Week: Celebrating a Slatebreaking Year! Thank you both for a wonderful year of blogging. You’re an amazing resource for so many of us and I love the people and book connections you foster. Happy anniversary! and happy summer reading to us all. I’ve said it before and I’ll say it again, Carrie Vaughn is a slatebreaking author! Her YA “Steel” is about a young female fencer who travels back in time and uses her swordfighting skills to hold her own with pirates! What could be a better summer beach read than that? Happy first birthday, Slatebreakers! You rock! Ok, that sounds perfect. I have always secretly wanted to learn fencing. Adding to my to-read list! Thank your for your wonderful blog! I look forward to reading each of your reviews. My favorite slatebreaker from last summer was Beauty Queens by Lilla Bray. So funny! Thanks for all of the ideas all year long and particularly for the suggestions for this summer’s list! Happy Anniversary! My favorite slatebreaker is probably one of my earliest favorites–The Witch of Blackbird Pond by Elizabeth George Speare.